This is an excellent biography in many respects. At 710 pages not counting the Appendices it is a monumental work, which covers the life of the late Giovanni Baptista Montini, Blessed Paul VI, Pope. It is a challenging read even for those who have grown-up with the Catholic Church. For example, I never dreamed there were so many Cardinals—and over ½ of them are Italian! Finally I just gave up trying to keep track of the names, titles and offices. I am indebted to the author for the sheer volume of information he has amassed as well as the many side excursions he inspired me to take while I was reading Paul VI: The First Modern Pope. My admiration for his achievement almost makes me want to stop this review now, without any reservations. Almost. And yet, part of me wonders if that is why he wrote such a tome, so it could be the last word on Paul...However, despite all I learned about Church history during the 20th century, Vatican II and many other subjects, I still must confess I didn’t come to know Montini, the man—which was my reason for reading this book—better as a result of it. Perhaps no book exists which will introduce me to him in quite the way I desire. And yet, toward the end of his life, Paul had a young Irish secretary, Fr. John Magee, who (as a much older man now) has made a Lighthouse Media CD on the Untold Stories of the Last Three Popes”. It was listening to that, the excellent 2008 movie, Paul VI The Pope in the Tempest, and a story my pastor told about Blessed Paul which inspired my desire to come to know more about this quiet, gentle man who never wanted to be pope. Magee spoke movingly of these men, but especially of Blessed Paul. The movie is one of my favorites and the story of my pastor revealed such a tender heart that I can’t help but believe there has to be a better, more intimate biography out there. As for Hebblethwaite’s bio, it ended abruptly with Paul’s dying words. There is nothing about his funeral, legacy, or successors, especially with respect to their combination of Pope John’s name and Paul’s, which spoke volumes to the entire world. That was disappointing to say the least. And I did not appreciate all the conjecture. Mr. Hebblethwaite made statements about Pope Paul’s motives, feelings and rationale, which he had no way of knowing one way or another. They were usually good guesses but he made them sound like they were facts when there could just as easily been other motives, feelings and rationale unknown to him. One last thing. At first the author seemed good at explaining theological issues which arose over the course of Paul’s long life, and yet, as I went along I began to have the uneasy feeling that if these issues were complex enough to lead to controversy in their day, how was it that Mr. Hebblethwaite was able to understand them so easily, explain them in little more than a paragraph or two, and devote most of the text to the personality clashes? Other readers might appreciate Hebblethwaite’s gossipy style more that I did. We are not all reading for the same reasons. Also, some of my criticisms might not matter to other readers as much as they did to me. Below are listed things I discovered and liked about the book. It is recommended with some reservations. October 28, 2017: Ministeria quaedam may well be the least known papal document there is and yet it affects modern Catholics more than so many others. I was so excited when I read about this in Hebblethwaite's book, I had to stop this book, look it up and read it. So, okay, he does drive me crazy with some of his opinions, but he is teaching me a lot too. 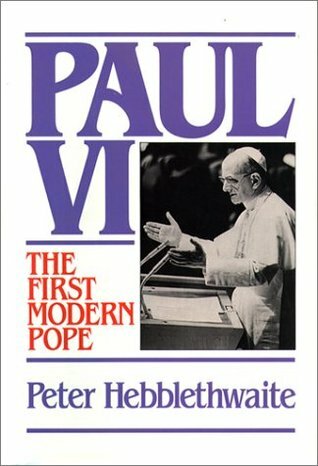 October 15, 2017: In this biography on Pope Paul—Giovanni Baptista Montini—Hebblethwaite makes reference to the biography of St. John XXIII, Pope John XXIII: Shepherd of the Modern World, he has written. Ordinarily I find that rather annoying—as it sounds like an author taking the opportunity to sell another book. Not so here. Hebblethwaite just knows both popes and the many ways and times their lives intersected and it only seems to add interest as if hearing a tidbit from an old friend. As this book is literally the weight and thickness of a brick and reads like a mini-course in papal history of the mid-20th century and Vatican II, including the theological issues of the era, I am not making fast progress, so thought I would jot down a few thoughts/impressions so far: •	Italian politics impacted the Vatican and therefore the Church far more than I ever realized. This was especially so during WWII.•	The real value in reading such a comprehensive biography is that you get to see the complexity of the person. And even so, he is still a mystery. Hebblethwaite shows how Montini’s critics have tried over the years to dismiss him as liberal or conservative, as Pope Pius or Saint John’s ‘man’, as a ‘diplomat’ or ‘sickly’. And yet even the author, who has made such a detailed study of this life, often can only speculate on Paul’s true motive in a particular situation. •	To truly understand any papal document requires so much more than just reading the actual document, especially the older ones. As a minimum, investigate its contextual history, determine its purpose, who the key drivers were, what and how it was received, both short- and long-term. This is not to discourage anyone from reading these, but it has become clear from seeing all that transpires how complicated the entire process is. •	There were a few pivotal moments during Vatican II which affected the whole course of the council. One of these was a summit meeting on Wednesday, 23 October, 1963 when Cardinal Suenens spoke up for the laity; urging that the document they were drafting should bring out the charismatic and well as the ministerial role of the church, stress the role of ‘prophets’ as those who inspire people to live the Gospel. And he recommended that since charisms undoubtedly exist in the Church, they needed to be represented at the Council and women should also be included in their number for “unless I’m mistaken, women made one half of the world’s population”.